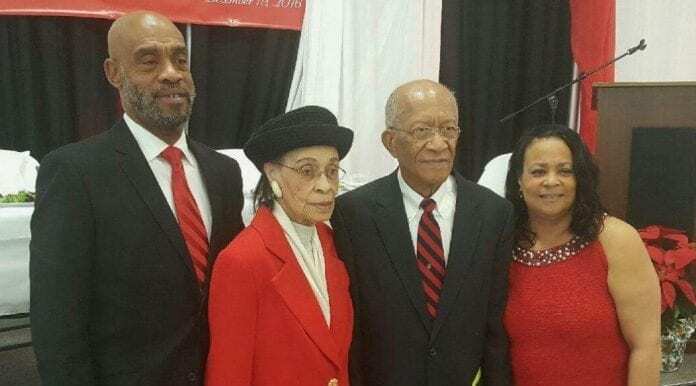 Mr. Homer Wheaton is joined by his family at his 90th birthday bash. Pictured from left to right is son, Kevin; wife, Vesta; Homer Wheaton; and daughter Rise Wheaton Pope. Under the theme, “Everybody Loves Mr. Wheaton,” the university hosted a formal reception in a packed Jane Elliott Hall Auditorium on Dec. 9 with family, former colleagues, students and friends to honor the man many refer to as “an instrument of change.” Wheaton turns 90 on Dec. 19, which has been declared Homer Wheaton Day.